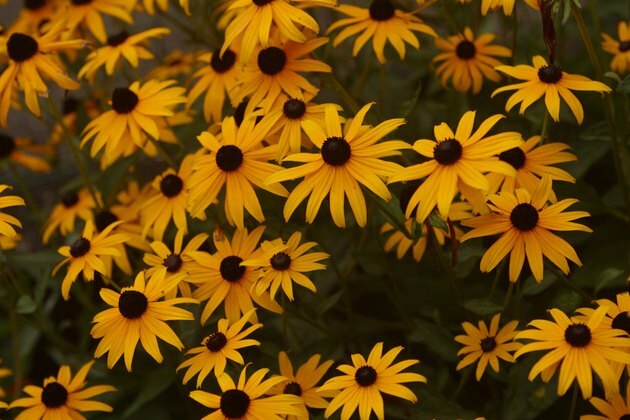 Black-eyed Susan, Rudbeckia serotina, is an attractive, vibrant little flower with bright yellow petals. The "black eyes" are the brown centers of the blossoms, which grow singly atop slender stems. Black-eyed Susans are members of the large Composite or Aster plant family, which includes daisies, sunflowers and numerable other garden flowers. Many flowering weeds look like black-eyed Susans. 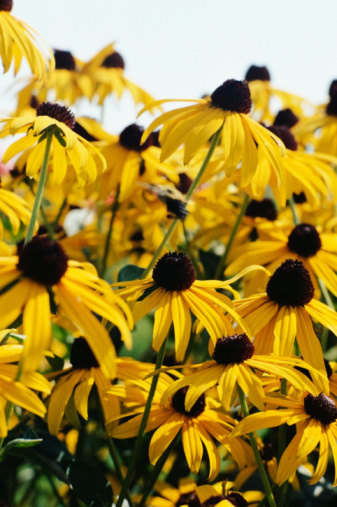 Black-eyed Susans are also known as yellow coneflowers. The black-eyed Susan is a perennial, which means that it reproduces on its own. Black-eyed Susans create seeds that form new flowers, and they will rebloom in the same location year after year. The flowers bloom from June to September. Black-eyed Susans are wildflowers that grow without cultivation, and because of this they may also be classified as weeds. The flowers may become invasive in garden areas. Desert marigold, Baileya multiradiata, is a yellow wildflower that bears resemblance to the black-eyed Susan. As the name suggests, desert marigolds grow in Arizona, Nevada, Utah and other areas of the American deserts. Perennial desert marigolds grow on shrubs that reach 1 to 2 feet tall and just as wide. The oblong, bright yellow petals of the desert marigold grow around central gold disks, in the same manner that black-eyed Susan petals grow symmetrically around brown centers. Desert marigold blossoms have a row of double petals with ruffled edges, unlike the smooth, single row of petals that black-eyed Susans produce. Maximilian's sunflower, Helianthus maximilianii, is a tall, perennial flower that grows 3 to 8 feet tall. Maximilian's sunflower grows in a variety of soil types, but thrives best in dry conditions. The flower spreads aggressively and may become very invasive in garden environments. Maximilian's sunflower blossoms have large, central eyes that are dark yellow to brown in color. Two rows of vivid yellow petals grow around the central eye. Like many sunflowers, the blossoms grow parallel to the top of the stem, instead of blooming up from the top. Oxeye sunflower, Heliopsis helianthoides, is also a weedy perennial. The stems grow as tall as 5 feet; each holds a single large blossom that resembles black-eyed Susans. The daisylike flowers have slender petals that grow around a central, dark yellow eye. Oxeye sunflowers prefer moist, rich soil and grow in full sunlight to partial shade.